Includes the entire text of the NFPA 1: Uniform Fire Code and the NFPA 101: Life Safety Code with all Florida changes, additions, deletions, and exceptions. Went into effect Januay 1, 2018! 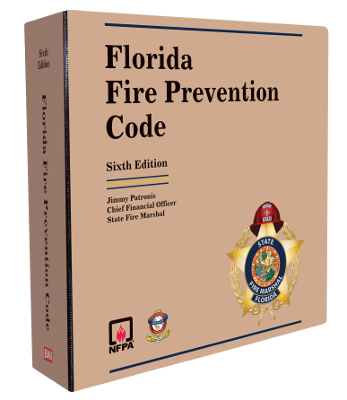 The Sixth Edition of the Florida Fire Prevention Code brings together the entire text of the 2015 NFPA 1 Uniform Fire Code and the 2015 NFPA 101 Life Safety Code, and it clearly identifies all State of Florida changes with an FL in the margin. The Florida Fire Prevention Code, Sixth Edition gives you fingertip access to current regulations pertaining to everything from smoke detection systems to industrial ventilation requirements. This is an essential code for fire marshals, architects and engineers, building owners, and professionals involved with hazardous materials in the State of Florida. If you need to know about fire prevention in the state of Florida, you need the Florida Fire Prevention Code.